John C. Taylor, my classmate and friend, was actually John C. Taylor the third. His grandfather (Dr. John C. Taylor) had come out to India in 1914 as a missionary physician and was one of the venerable old missionaries of North India, known far and wide. His son, Dr. John C. Taylor II, was a dentist and also a missionary. Mr. Taylor (the dentist, we never called him Dr. Taylor for some reason) was a man’s man, big, burly, and was a raconteur of the first waters. His specialty was hunting stories and they were always captivating. When he was at our table it never took much to get him to tell one of his stories. And he could tell stories. Once he caught a ghoral (a mountain goat) with his bare hands. This is an incomprehensible feat. He shot a wounded a bear that mauled his gun bearer–ripped his face off. Mr. Taylor sewed it back on. Tigers. Leopards. Wild boar. Hunting Ibex in Kulu Valley with Dil Das, a renowned local shikari (hunter). He had a tale for every occasion. We loved his stories from yesteryear, mainly, I think, because we knew all the places and a lot of the people involved. And of course his compelling ability to weave a tale. Gordon Taylor (holding one of his sons), his father Dr. John Taylor, Beth (Gordon’s wife) and Dr. John Taylor, my classmate John Taylor’s dad . By the time we started to hunt, game in North India was on a steep decline. There are more blackbuck in Texas where I live now than in North India. A ban was imposed on tiger hunting. Too many people, too many guns, resulted in too little game. It may not have been the good old days, but we still had fun. When we came back from our furlough in ‘63 Gordy and I both brought .22s. While we were in Dallas we had paper routes and that provided the money we needed to buy a few things for ourselves. I learned a couple of things from that paper route. First, I am not a morning person and 4:30 on Sunday morning in the dead of winter is an awful time for a 12 year old boy to be up to throw papers. Second, making money is easy. Collecting it is harder. And third, people in bars that are half soused make perfect customers for your extra papers. But I digress. India has very tight gun control laws. Guns must be registered and you pay a license fee each year. Highly regulated. You even have to have a permit to buy ammo, and ammo was expensive. Was. Eventually we learned how to make our own gunpowder from Jay Strong in Tanakpur, and how to reload shotgun shells. He even reloaded 22 shells. 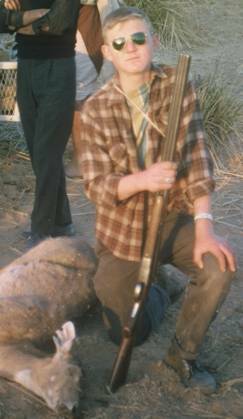 Once we hit high school, dad accommodated our interest in hunting-sometimes helping us get a hunting block in Dhanaulti, or sometimes hunting in places like Jhansi or, as in this case where Gordy has his first chinkara, in Rajasthan. If Chemistry class had been as fun as we had making gunpowder I would have done a lot better. We’d buy the saltpeter from one chemist. The carbon was available from crushed charcoal and the sulphur we’d get from a different chemist (no need to unnecessarily alarm the banias (shopkeepers) in town who might know that these fixin’s could be mixed to produce an explosive.) Once in proper proportion we had to pour water on it and mush it around into something like the consistency of mashed potatoes. At this point we would take a fine screen (the one off our window worked well) and took a glob and ran it back and forth on the screen over some newspaper, and what was extruded were small flakes and voila!, gun powder. All we had to do was wait for it to dry. There were quite a number of different types of pheasant in the area, but you had to be a Bob Fleming to actually have seen them all. Mostly people were aware of the common ones, Kaleej, and a little higher up, Koklas. But in fact there were also Monal with their indescribably beautiful iridescent indigo feathers; Trogopan, rare and seldom seen; Chir, a higher altitude pheasant that somehow found its way to our area. There were also Hill Partridge, Chukkar and occasionally Woodcocks. And, at a lower altitude there were jungle fowl that look surprisingly like a domesticated chicken, as well as peacocks. Then there were deer, mostly kakar, a barking deer (Muntjac). And yes, it really barks when alarmed. Also sambur, (like an elk) although these were pretty much decimated up in the hills you could occasionally catch sight of one in the Dhanaulti area. There was musk deer. These had been completely shot out for their small pod of musk, or so we thought until Steve Schoonmaker shot one by mistake thinking it was kakar (he must be color blind). We also had a type of goat-antelope called ghoral, about the same size as a goat. They were difficult to spot and lived in the most precipitous places imaginable. There was also something called a serow, a larger version of the ghoral, about the size of a donkey. Again, we thought they had been shot out too until Gordy got one below the cemetery. 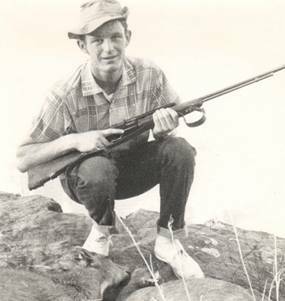 In our family Gordy was really the hunter. He was good at it, primarily self-taught. He had the patience to sit and wait in the forest, usually on a promontory somewhere below the chukkar. He was an excellent shot. He learned that his .22 was good for about 200 yards if the wind was not blowing. If he was shooting downhill he remembered to aim a couple inches low due to updrafts. He got good. By the time he graduated he had shot, on average, at least one animal a month—a total of about 40. The winter of my senior year dad was invited by Gordon Taylor, missionary brother of John Taylor II, uncle of John Taylor III, my classmate, to be the speaker at a retreat for a number of the senior boys from the Bhogpur Children’s home. This was a “home” run by the Reformed Presbyterians half way between Dehra Doon and Rishikesh for the children of lepers. It was not an orphanage because these kids had parents. It was the cruelest of situations. If they stayed with their parents they got leprosy. The only way not to get it was not to stay with them. The home and school was (and is) well run with hundreds of children. The main house in this compound where Gordon and Beth Taylor lived was…cool. 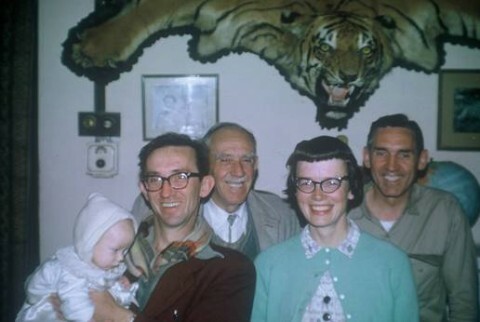 You entered the main living area and it was blanketed by bear skins, tiger skins, and leopard skins. The walls went up 15 feet and were covered with trophy cheetal, sambhur, and every other type of animal with horns. And he too was a born storyteller. Bhogpur was a favorite place to visit. The retreat for the Bhogpur senior boys that year was held at a place called Patri near Hardwar, one of the highest high holy sites in India. The retreat was taking place in a forest rest home in a “block”, a designated hunting area. Hey, if you are going to do a retreat, might as well as get in some hunting. Along on that retreat was my friend John Taylor with his younger brother, Fred. The retreat was already in session when we arrived (“we” being dad, me, Norman and Vernie, since Gordy has left for college by then. Mom and Lynn were back at home). The previous evening Gordon Taylor heard some leopards in the area, grunting away and with a little a investigating came to the conclusion that there were two or possibly three in the area. At Gordy’s feet (below) are a couple of smallish Ghoral. 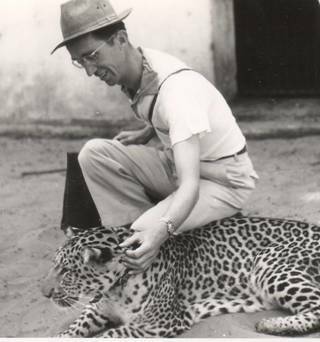 In the tradition of the Taylors, John, who had never shot a leopard, got first go. He turned to me and asked if I would sit with him as backup. Gulp. OK, OK, equal measures of trepidation and terror with nothing to counterbalance those emotions. The sun set at around 5:45. 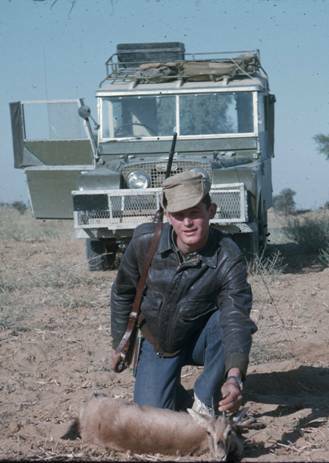 At around 3 we set off with the Land Rover, some rope and a charpai (rope bed) on the rack. We found an open area in the forest less than a mile from the Forest Rest Home. In this clearing was a large tree that we could drive under and without too much trouble climb onto a limb and pass the charpai up. We lashed it down across a fork in a stout branch. It was perhaps 12 feet off the ground, max. This, then, composed our machaan. We climbed up. What we agreed to was this. At 3:30 the guard would drop off a small kid (a goat) and stake it about thirty yards in front of us in the clearing. Separated from its mother in a secluded and scary area it would start bleating. If we were lucky the leopard would hear this tender morsel begging to be eaten. I know it sounds heinous, but that is the way it was done. If we got a shot off they would come get us. Simple. Gordon Taylor with a pet leopard. John was using a .458 rifle. This was overkill, an elephant gun really, but it was all he had available at the time. I held the shotgun loaded with double ought buck and we had a .22 as well. The guard came at 3:30. The kid turned and watched the guard leave. As soon as the guard was out of sight it began to bleat plaintively, loud and long. We were giddy with anticipation. You can read all the Jim Corbett stories you want, but I am here to tell you that if you are not used to crossing your legs and sitting still for a couple of hours without moving it is sheer agony. The day was cool, but not cold, but we both knew that as soon as the sun went down the temperature would drop. The kid bleated. The afternoon wore on. The kid stopped bleating around 5 and lay down. About 45 minutes later, just as the sun was setting and at the time of twilight when things are beginning to get hard to see the kid got up and faced our tree. Had it spotted us? No, it was looking at the base of the tree we were in. Yikes! We could not see down through the ropes and branches directly below us. All of a sudden a leopard charged out from below us right in front of the kid and abruptly stopped. The kid was mesmerized. John shouldered the gun. “Click” –he flicked the safety off. In that instant the leopard dashed off into the forest. Drat! One tiny click and it was gone. We continued to sit still. Our muscles were cramping, it was getting cold, and the tension was unbearable. Looking down I nudged John. The leopard was slowly walking back out from under our tree to the kid. When it got there it sat down, back towards us and turned ever so slightly and looked over its left shoulder. John shot. It is not a good idea to be sitting too close to a .458 when it goes off if you can help it. Here’s what happened. Muzzle flash. Kaboom! Ringing in my ears. Kachunk as John reloaded. Charpai swaying. And leaping before us at eye level was Mr. Leopard emitting a blasting roar that caused my sphincter to go into spasms. This all happened in the same nanosecond. By now it was nearly dark, we could hardly see. This mortally wounded leopard continued to leap, roar and contort in the clearing. Apart from the fact that it was nearly dark and that the beast was lurching erratically into the air there was no way Mr. Backup Shotgun Man could draw a bead on this bouncing maniac leopard because he could not see the bead at the end of the shotgun to aim with. A minute before we were keeping very still and very quiet to get the leopard to come. Now we were keeping very still and very quiet so the leopard would not come. The leopard finally settled down and drug itself off deeper into the lantana on the far side of the clearing. We could hear it dying. A team of wild elephants could not have pried us off that machaan to finish it off. We were well aware that there are few things as dangerous as a wounded leopard, especially a dying wounded leopard. The shot could be heard all the way to Hardwar for sure. So the folks a mile away in the Rest House knew we had taken a shot. And then they could easily have heard the roaring. So, help would be on the way soon. Just to make sure there was no doubt we were done and wanted to be picked up, we shot off three rounds with the .22 and waited. And waited. At 8PM we wondered what was the matter with them? We sent off three more shots. Nothing. At 10:30 they showed up, our feelings a mix of relief and resentment. We slid onto the rack of the Land Rover; Mr. Taylor got out and had a look at the great gouts of blood. The traumatized little goat was trundled into the back of the vehicle. The leopard made its presence known in the nearby lantana. Mr. Taylor got smartly back into the Land Rover. The spotlight was cast around the area, great gouts of blood, but no leopard. The reason Mr. Taylor had delayed in coming was to give the thing plenty of time to die because lots of roaring after a shot is not a particularly good sign of a clean kill. We were pretty pumped up about now and recounted in detail every thing that happened. John was well on his way to joining his father and uncle as a raconteur, including information that had I not been there and had this not just happened I would have sworn might actually have happened. We had a wonderful night’s sleep and got up early. The plan was to go out and collect the thing and get it skinned. It would then be sent to the taxidermist. Just after breakfast we headed for the clearing of the previous night’s adventure. Blood everywhere. Surely it was dead by now. Everyone bailed out of the vehicle. I had our 12 gauge. David Fiol, another missionary, had his .22. John had the .458. In all about eight guns or so and about 10 people. As we stepped into the forest to follow the blood we got a pretty persuasive reminder to be very, very careful–a full-throated growl of a very living leopard. It was close and it was not mortally wounded. But it was wounded. Every time we would penetrate into the jungle a little further so would it. The brush was thick enough we could not see very far and we never even caught a glimpse of the thing. The next morning we had to leave. Dad was slated to speak at the Strong’s farm in Tanakpur and we headed out in the Land Rover and drove to Bareilly, where there was the Methodist hospital and the home of the Petersons. Mr. Peterson was my dentist for years. My lasting memory is that he had very hairy knuckles and when he had his fingers in my mouth it would tickle my lips. If you are going to have your teeth worked on this is not an altogether unpleasant experience. We stayed at the Methodist Guest House, next to the hospital. 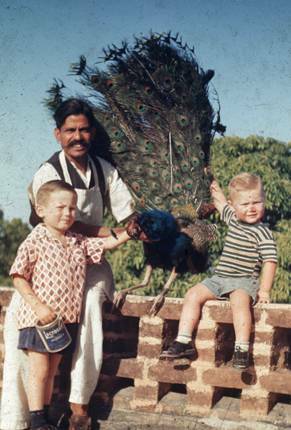 Mr. Peterson also enjoyed hunting, and there was quite a bit of game around Bareilly. His best story ever, in fact it rates very high in my book, was the quick shot into a herd of nilgai (literally “blue cow”, a type of antelope about the size of a mule) as they were running full bore away from him. One dropped. On examination there was not a single wound on this full-grown nilgai of several hundred pounds Very strange indeed. The conclusion was it must have died of a heart attack. Even upon skinning it there was not a mark on it. However, when they proceeded to butcher it the heart was totally demolished. They traced the bullet wound back, back, down, down…and yep. That bullet went exactly up the point of entrance “where the sun don’t shine”, as they say in Texas. But back to the story. The next morning who was there at the Guest House eating breakfast but David Fiol, much to our surprise, whom last we left hot on the trail of the leopard. It turned out the leopard had leaped up and bitten him on the upper arm and he had just gotten in early that morning by train to be treated. He was another raconteur and we got the entire story in vivid, living color. Apparently the day we left they were back on the trail of the wounded leopard. There was a lineup of six guns. Since he had a .22, the smallest gun of the lot, he was at the back of the pack. They were slowly, slowly tracking the thing when all of a sudden the “mortally wounded” leopard burst from the undergrowth very close to them and charged him. Before it got to him at least three people shot and at least two hit it. When it leaped it grabbed his left arm above the elbow–see, right here–and bit. As he was telling the story he described with amazing detail the smell of the leopard’s rotten breath, his reaction to being selected as the target of the wrath and fury of the beast, and his thoughts as he was knocked over and the leopard ran into the bush. Not many people are leaped upon and bit by a leopard and live to tell about it. David did know how to hold your attention. At this point we wanted to know if he was OK because one might easily mistake from his story that he was pretty near death. He took off his old army jacket and pulled up his sleeve to show his puncture wounds. They were there…just barely. And he had already received a tetanus shot that morning. It was black and blue, yes, but there was not even a bandage around it. O.K., so he got bit, and there was a story here. But…. They eventually found the leopard a couple of days later. Dead. Eaters of carrion had been there first and the pelt was ruined. 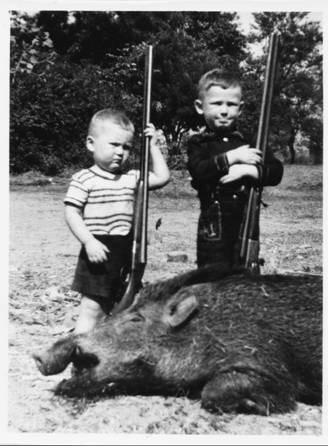 I love hunting stories and hunters are the world’s best raconteurs. But believe me, they gild what happened. Don’t believe any hunting story from places like India or Africa unless you were there. Except for this one of course.